The NASA Wallops Flight Facility Visitor Center is proud to announce the 2019 YOUTH ART CONTEST open to Pre-K through 12th grade students. "Apollo's 50th Anniversary" is the theme for the 2019 Youth Art Contest. This NASA-unique theme aims to inspire art through the celebration of Apollo as we push towards returning to the Moon and take the next giant leap in deep space exploration. It is designed to encourage students to use the elements of art to help them understand and explore the role of the Apollo missions in NASA's advancements in human space exploration. NASA imagery of Earth's Moon and all aspects of the Apollo missions, will be the inspiration as students make the connection between science, history, and art. Entries must be submitted or postmarked by Saturday, June 15, 2019. Late entries will not be judged. Details and registration forms available online. For more details: Visit www.nasa.gov/content/apollo-youth-art-contest. Local and national carvers and artists of all kinds exhibit and sell their work at this Chincoteague Island tradition. Awards are given in various carving categories, art and photography. The Pre-loved Treasures Silent Auction has been a favorite in recent years. Friday, April 19 - Noon to 6:00pm. Saturday, April 20 - 9:00am - 4:00pm. $4.00 admission each day; children under 12 are free. For more details: Visit www.chincoteaguedecoyshow.com/. CIAO is pleased to announce that another great series of classic films will be offered each Friday night at 7:00pm at the Island Theatre starting on December 14th and ending on April 26th. Admission to see these terrific films is just $5.00. This week's film is "Fly Away Home". For more details: Visit chincoteagueislandarts.com/. Drop in for short activities about how the Earth, the solar system and beyond are being explored today. Approximately 1 hour. Geared toward ages 6 and up. For more details: Visit www.nasa.gov/content/wallops-visitor-center/public-programs. During this program we will investigate a STEM related topic through labs, demonstrations and activities. Approximately 30 minutes. Geared toward ages 8 and up. Check the website for this week's topic. For more details: Visit www.nasa.gov/content/wallops-visitor-center/public-programs. Island Coffeehouse is held once a month at the community center for the arts - 6309 Church Street, Chincoteague Island, Virginia. Musical and spoken performances, visual art, beverages and snacks in a convivial atmosphere. Everyone is welcome. Doors open 6:30 pm; Performances begin 7:00 pm. Admission: $5 for adults, $3 for students aged 22 and under. Homemade sweets, coffee, beer, wine and soft drinks are available for purchase during the event. For more details: Visit www.chincoteagueca.org/coffeehouse.html. Everyone is invited to attend the Easter Sunrise Service on Sunday April 21st, 6:30am. Come join our community for an early morning service of praise music and worship while the sun rises behind us. Dress Casual and Warm! Come Early! Limited parking. Only 30 minutes. Bring you friends, family, and neighbors. Join us in the Robert Reed Downtown Park for a one of a kind vendor market! Including kids crafts, local art, and a giveaway eligible for each purchasing customer. You are able to shop multiple local vendors the third Sunday April - September from noon until 4pm. For more details: Visit www.facebook.com/events/816855431985850/. The CCA Community Center for the Arts building was formerly the Cafeteria of the old Chincoteague High School, and the back room was the Kitchen. As part of our recent renovations the Kitchen is now a clean modern space for classes and the Kitchen Gallery, showing regional art. For more details: Visit www.chincoteagueca.org. Check out our free Monday Game Day gatherings at the Annex from 1:00-4:00pm. For more details: Visit www.facebook.com/events/1053311981546091/. Year-Round Preschool "Tales for Tots": Preschool Stories, Crafts, Songs & Finger Plays. Thursdays at 10 AM. The books, songs, finger plays, and crafts are specifically geared to preschool children from almost 3 years old to 5 years old. Accommodations will be made for quiet study in the front room of the library for older children who are accompanying their preschool siblings. Parents/grandparents and/or guardians must accompany their children. Please note: Story time will be canceled if the Accomack County Schools are closed due to snow or ice. Don't forget to visit our Facebook page for photos and the latest news. For more details: Call 757-336-3460. Visit www.chincoteague.com/chincoteagueislandlibrary/programs.html. Monthly Story Swaps are always offered free of charge, including free refreshments. Each month has a different theme. The storytelling starts at 7 pm. (Doors open at 6:30.) The Chincoteague Storytelling Guild believes everyone has a story. As always, your participation is KEY to a great story swap. Get your creative juices flowing now so you can join in the fun!! For more details: Visit www.chincoteagueca.org/chincoteague-storytelling-guild.html. Entry is $25 per person for the Flounder Tournament. The BBQ/Cookout/Pot Luck/Prizes will be Friday May 3rd, 2019. Prizes and sponsorships are being finalized but usually over $3,000 in cash/prizes/door prizes awarded. CIAO is pleased to announce that another great series of classic films will be offered each Friday night at 7:00pm at the Island Theatre starting on December 14th and ending on April 26th. Admission to see these terrific films is just $5.00. This week's film is "Saturday Night Fever". For more details: Visit chincoteagueislandarts.com/. 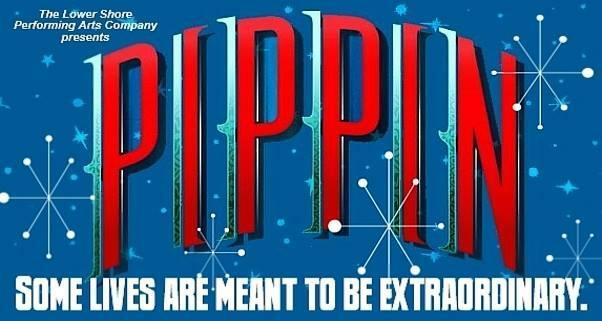 PIPPIN! Saturday, April 27 at 7:00pm and Sunday, April 28 at 3:00pm at the Island Theatre... Come out and see one of the most beloved and longest running Broadway shows of all time performed by the Lower Shore Performing Arts Company! Live music during the performance! Tickets are $18.00 for info and to purchase, please visit www.lowershorepac.org or https://www.brownpapertickets.com/event/4208173 - you may also purchase at Sundial Books on Main Street OR buy at the door! (All shows are general admission; seniors, active military, and first responders are $15 per person and family/household is $45. Students are $10 with ID. Children under 10 are FREE.) For more details: Visit www.facebook.com/events/392491747996017/. Join us for Chemists Celebrate Earth Day. Drop in to participate in hands-on chemistry activities. Approximately 1 hour. Geared toward ages 6 and up. For more details: Visit www.nasa.gov/content/wallops-visitor-center/public-programs. Listen to a story and make a craft that will explore different science themes. Approximately 30 minutes. Geared toward ages 3 to 6. For more details: Visit www.nasa.gov/content/wallops-visitor-center/public-programs. Great things from farm, field and bay plus quality arts, crafts and attic treasures. The market is your farm to table provider. Look for seasonal fruits and vegetables, seafood, eggs, meat and more! And jewelry, carvings, photos, fabric arts, plants, soaps, and other crafts. Saturdays: April 27 to October 26. Wednesdays: June 12 to August 28. For more details: Visit www.chincoteagueca.org/markets.html. Refuge hours change to 5:00am - 10:00pm for the summer. For more details: Call 757-336-6122. Email fw5rw_cnwr@fws.gov. Visit www.fws.gov/refuge/chincoteague/. The Boy Scouts of America, Del-Mar-Va Council will be hosting a Cub Scout Camporee Day with the NASA Wallops Flight Facility Visitor Center on Saturday, May 4, 2019. During the event, Cub Scouts will have an opportunity to explore lunar-themed activities. The Visitor Center will provide a variety of hands-on activities through a series of STEM stations featuring Earth's Moon. Registration is required through the Del-Mar-Va Council. Space is limited! For more details: Visit www.nasa.gov/centers/wallops/visitorcenter. 5 x 5 is a creative fundraiser and celebration that takes place after the Annual Seafood Festival on Chincoteague Island. The art show and sale features artworks that are all 5 x 5 inches in size and they sell for $25 or $55. The show and sale starts promtly at 5:55 pm when the artwork is revealed to the public for the first time. But plan to arrive at 5 pm to enjoy food from Bill's Restaurant, wine, and beer. A spirited musical performance by Greg Shupe & Island Vibe will add to the festivities. If you would like to contribute original artwork to the event, please call the Museum at 757-336-6117. You may choose any media and subject matter. The only restriction is that all work must be 5 inches by 5 inches in scale. If you need a 5" x 5" canvas, the Museum has canvases for participating artists. All contributing artists will be admitted to the event free of charge. Fee: $5 (Artists and volunteers get in free of charge). For more details: Visit chincoteaguemuseum.com/programs. Held every the 1st Saturday of each Month from 1pm - 2pm. Held at the CCA Community Center for the Arts - 6309 Church St. Young kids please bring an adult. All supplies provided. Taught by CCA artist volunteers. For more details: Visit www.chincoteagueca.org/. It's a Tradition! A spring seafood festival has been held here on Chincoteague Island for FIVE decades. Tickets are $45 per person. For more details: Visit www.chincoteaguechamber.com/events/51st-annual-chincoteague-seafood-festival/. The NASA Wallops Flight Facility Visitor Center and its partner the Delmarva Space Sciences Foundation will host an Astronomy Night event from 7:30 to 10 p.m. on Friday, May 10. This event begins with an astronomy presentation in the Visitor Center's auditorium at 7:30 p.m. followed by night sky observations through high-powered telescopes operated by the Delmarva Space Sciences Foundation on the grounds of the Visitor Center from 7:30 p.m. until 10 p.m. Drop-in, hands-on space science activities, videos, and astronomy resources will also be available from 8 - 9 p.m. The astronomy presentation and indoor activities will take place regardless For more details: Visit www.facebook.com/events/676288786124296/. Don't miss out on the fun! Spread your wings and soar over to the refuge for the 25th Annual World Migratory Bird Day Celebration. From 10:00 AM - 3:00 PM, Chincoteague National Wildlife Refuge teams up with the Chincoteague Natural History Association to offer visitors a fun-filled day of family friendly activities. The refuge will feature family-friendly activities, birdhouse building, conservation exhibits, wildlife artists, a live-animal presentation (Salisbury Zoo), and refreshments. Tours of the Assateague Lighthouse will be provided by the Chincoteague Natural History Association as well as ranger-led programs by Assateague Island National Seashore. For more details: Call 757-336-6122. Visit www.chincoteaguechamber.com/events/chincoteague-national-wildlife-refuge-fee-free-day-2/. During this presentation, we will take a tour through our solar system with stops at the sun, the planets, dwarf planets and moons. Approximately 30 minutes. Geared toward ages 8 and up. For more details: Visit www.nasa.gov/centers/wallops/visitorcenter. Listen to a story and make a craft that will explore different science themes. Approximately 30 minutes. Geared toward ages 3 to 6. For more details: Visit www.nasa.gov/centers/wallops/visitorcenter. The Farmers and Artisans Market is greatly expanded and features an amazing array of arts, crafts, antiques, collectibles and attic treasures. Pick up fresh local produce and seafood until 1:00 PM. May 11, June 8, July 13, August 10, September 14, and October 12. For more details: Visit www.chincoteagueca.org/markets.html. Entrance fee is waived on this day of observance for the World Migratory Bird Day Celebration. For more details: Call 757-336-6122. Visit www.fws.gov/refuge/chincoteague/. Prizes will be awarded. Winners will be exhibited at CCA in July and winners will be invited to show their 20 favorite island photos at a reception on Friday, July 19. For more details: Visit www.chincoteagueca.org/photography-contest.html. Join Sam the Monkey and Puppet Astronauts Jenny and Jeff as they go on an adventure in space. Approximately 30 minutes. Ages 2 - 5. For more details: Visit www.nasa.gov/centers/wallops/visitorcenter. Have you ever wondered about other planets when looking up at the night sky? Join us for a short program to learn about one of the other planets in our solar system. Approximately 15 minutes. All ages. For more details: Visit www.nasa.gov/centers/wallops/visitorcenter. Come watch First Responders go head to head in friendly competition. Bounce house, fire truck, k-9 demo. For more details: Visit koa.com/campgrounds/chincoteague. Join Chincoteague Cultural Alliance (CCA) on May 19 for the CCA 'Fun'draiser Cruise! The popular Sunset Cruise will be held this year on Sunday, May 19th. Join CCA for a scenic cruise around Chincoteague Island courtesy of Daisey's Island Cruises. Food, beer, wine and soft drinks are included. Proceeds go to help the CCA promote art activities on the island. Tickets are $40. Be at Curtis Merritt Harbor by 5:00 pm. Cruise leaves promptly at 5:30 pm and lasts after sunset (at 8:08 pm). For more details: Visit www.chincoteagueca.org/store/p159/sunset-cruise-tickets.html. Music at the Dock is a series of free concerts held at the Robert Reed Downtown Waterfront Park. Bring a blanket or chair, or dock your boat, and enjoy the music. Dancing is allowed! Concerts begin at 7 pm. In concert: Rhythm in Blue. This jazz ensemble is a unit of the United States Air Force Heritage of America Band. Made up of outstanding Air Force enlisted professional musicians, Rhythm in Blue takes great pride in preserving America's uniquely original art form, playing an extensive repertoire highlighting instrumental and vocal soloists. For more details: Visit www.chincoteagueca.org/music-at-the-dock.html. Learn about the sub-orbital sounding rockets and see the principles in action by launching model rockets. Approximately 30 minutes. All Ages. Model rocket launches are weather permitting. For more details: Visit www.nasa.gov/centers/wallops/visitorcenter. During this program we will investigate a STEM related topic through labs, demonstrations and activities. Approximately 30 minutes. Geared toward ages 8 and up. Check the website for this week's topic. For more details: Visit www.nasa.gov/centers/wallops/visitorcenter. Monthly Story Swaps are offered free of charge, including free refreshments. Each month has a different theme. The storytelling starts at 7 pm. (Doors open at 6:30.) The Chincoteague Storytelling Guild believes everyone has a story. Your participation is KEY to a great story swap. Get your creative juices flowing and join in the fun!! For more details: Visit www.chincoteagueca.org/chincoteague-storytelling-guild.html. 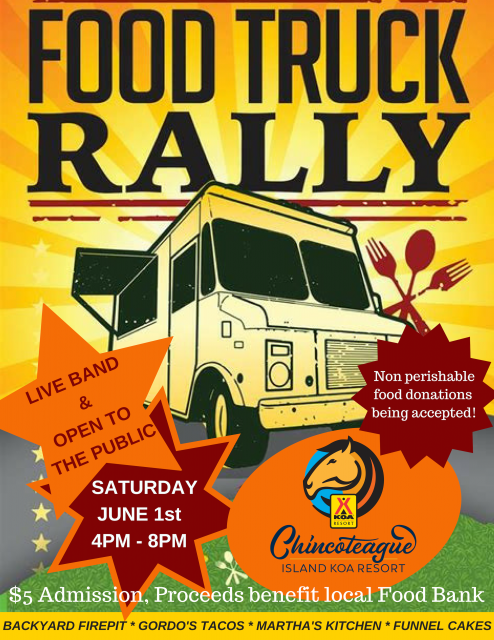 Get a taste of local food trucks and enjoy live entertainment, all for a good cause! This great event is open to the public. $5 admission. Proceeds benefit local Food Bank. For more details: Visit koa.com/campgrounds/chincoteague. Chincoteaguer, Jenny Somers, has been involved as a behind the scenes volunteer for the CCA since our inception. You may know Jenny as the owner of Bayside Arts (open for many years on Main Street), as a tour guide on the Refuge service road, or as a familiar face at local art shows. She has also been a popular instructor at many CCA art classes over the years. Unfortunately, Jenny has been diagnosed with cancer again. We don't want her to have to fight this alone. Our goal is to generate enough funds to give Jenny a financial cushion to help alleviate the stress of mounting medical bills and transportation costs while seeking treatment. Join us on June 2nd as we gather to support Jenny. Enjoy live music, an extensive array of hors d'oeuvres catered by Don's Seafood, and a fundraising auction (run by Zeb Barfield) that will include original artwork by Jenny's many friends and colleagues, gift certificates, and more. Want to help? Donate a piece of art, a gift certificate, or professional service to be auctioned at the event. Contact Cindy Faith to donate and arrange pickup. For more details: Email cndy_fth@yahoo.com. Visit www.chincoteagueca.org/support-jenny.html. Trio St. Bernard in Concert. Reception afterwards at the Annex. Trio St. Bernard are the winners of the First Place Prize at the 2018 Chesapeake International Chamber Music Competition. Presented by Chincoteague Cultural Alliance together with the Chincoteague Island Arts Organization. Tickets: $15 for adults. Free for youths (18 and under) and for students (with ID). For more details: Visit www.chincoteagueca.org/trio-st-bernard.html. Presented by the Chincoteague Island Theatre Company. Past events have included staged readings, improv, and one-act plays. For more details: Visit www.chincoteagueca.org/3rd-thursday-theatre.html. Free admission, vendors, food truck, and live music. Trophies awarded. For more details: Visit koa.com/campgrounds/chincoteague. CCA offers free films outdoors under the stars in Robert Reed Downtown Waterfront Park during the Summer Months. Bring a chair or blanket. Films begin at dusk. Enjoy popcorn and cold drinks at old-fashioned prices! In case of rain, films are shown at the CCA Center for the Arts - 6309 Church Street. Featured film: The In-Laws. For more details: Visit www.chincoteagueca.org/summer-cinema-series.html. 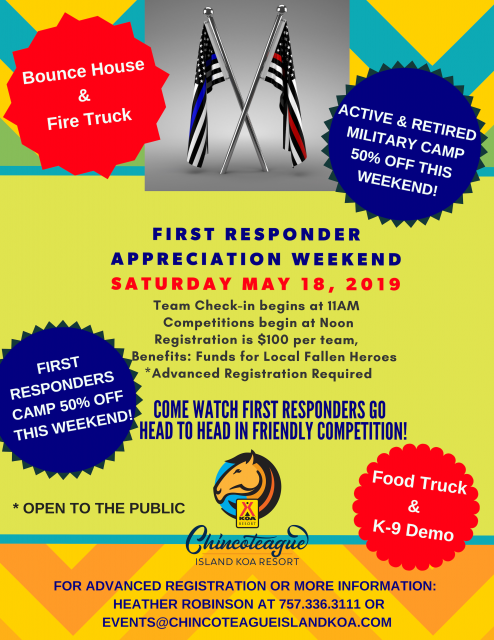 Opening night of the 94th Annual Chincoteague Volunteer Fireman's Carnival is TONIGHT! Rides, Games, Fun, and Food - Chincoteague Island style! A great variety of food is available for purchase from hot dogs and pizza to clam and oyster fritters. Rides and games for all ages. Live entertainment on the stage. Try your luck at BINGO too. Open the last Friday and Saturday in June and every Friday and Saturday in July. Also open each night during Pony Penning Week (not Sunday) through July 28th. All proceeds benefit the Chincoteague Volunteer Fire Company. Rides, Games, Fun, and Food - Chincoteague Island style! A great variety of food is available for purchase from hot dogs and pizza to clam and oyster fritters. Rides and games for all ages. Live entertainment on the stage. Try your luck at BINGO too. Open the last Friday and Saturday in June and every Friday and Saturday in July. Also open each night during Pony Penning Week (not Sunday) through July 28th. All proceeds benefit the Chincoteague Volunteer Fire Company. Music at the Dock is a series of free concerts held at the Robert Reed Downtown Waterfront Park. Bring a blanket or chair, or dock your boat, and enjoy the music. Dancing is allowed! Concerts begin at 7 pm. In concert: Salisbury Community Band. It's become a CCA tradition to bring this great local band to the Island around Independence Day to share a lively selection of patriotic songs and show tunes with an always enthusiastic audience. For more details: Visit www.chincoteagueca.org/music-at-the-dock.html. CCA offers free films outdoors under the stars in Robert Reed Downtown Waterfront Park during the Summer Months. Bring a chair or blanket. Films begin at dusk. Enjoy popcorn and cold drinks at old-fashioned prices! In case of rain, films are shown at the CCA Center for the Arts - 6309 Church Street. Featured film: The Englishman Who Went Up A Hill And Came Down A Mountain. For more details: Visit www.chincoteagueca.org/summer-cinema-series.html. Great things from farm, field and bay plus quality arts, crafts and attic treasures. The market is your farm to table provider. Look for seasonal fruits and vegetables, seafood, eggs, meat and more! And jewelry, carvings, photos, fabric arts, plants, soaps, and other crafts. Saturdays: April 27 to October 26. Wednesdays: June 12 to August 28. Note that there will be no market on Wednesday July 24 (Pony Swim Day). A market will be held Tuesday July 23 instead. For more details: Visit www.chincoteagueca.org/markets.html. The "Apollo's 50th Anniversary Youth Art Exhibit" entries will be on display at the Visitor Center from Thursday, July 18, 2019 through Saturday, September 7, 2019. For more details: Visit www.nasa.gov/content/apollo-youth-art-contest. An Opening Reception of the "Apollo 50th Anniversary Youth Art Exhibit" will be held on Thursday, July 18 from 5 - 7 p.m. Winners will be announced at 6:30 p.m. in the Visitor Center's Auditorium. Students not in attendance will be informed by email. For more details: Visit www.nasa.gov/content/apollo-youth-art-contest. Winners of the CCA's annual photo contest will exhibit their 20 favorite island photos at this reception on Friday, July 19. For more details: Visit www.chincoteagueca.org/photography-contest.html. Held at the beautiful Chincoteague Center on Chincoteague Island. This "beautiful land across the water" and vacation paradise on the Eastern Shore of Virginia hosts the Blueberry Festival every year on the Friday, Saturday and Sunday prior to the Chincoteague Pony Swim, from 9:00 am to 4:30 pm each day. The largest Fine Arts & Crafts Event on the Eastern Shore of Virginia. Non-Stop Family-Friendly Entertainment. Blueberries, Blueberries, Blueberries! For more details: Visit www.chincoteagueblueberryfestival.com. The Saltwater Cowboys will begin rounding up the Southern Herd, into the Southern Corral, Saturday afternoon beginning at about 4:30 pm. The Southern Corral is located on Assateague, just off the road that leads to the beach, and is accessible to the public. For more details: Visit www.chincoteague.com/pony_swim_guide.html. The Saltwater Cowboys will begin rounding up the Northern Herd, into the Northern Corral, Sunday morning beginning at about 7:30 am. The Northern Corral is not accessible to the public during the roundup. For more details: Visit www.chincoteague.com/pony_swim_guide.html. On Monday, at day break, the Saltwater Cowboys will move the ponies from the Northern Corral out to the beachfront then south along the Atlantic Ocean, and join them with the ponies in the Southern Corral. The Chincoteague National Wildlife Refuge will open at 5:00am on this day. To view the Ponies walk down the beach we recommend driving to the beachfront and parking in the recreational beach parking area. Bring snacks, water, bug spray and cameras to enjoy this special event. Bicyclists and hikers can use Swan Cove Trail to access the beach. For more details: Visit www.chincoteague.com/pony_swim_guide.html. Join us for 20 games of Pony themed Bingo for $20! 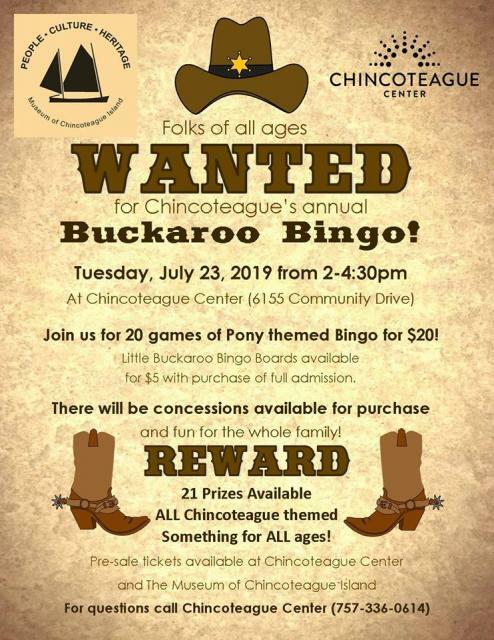 Little Buckaroo Bingo Boards available for $5 with purchase of full admission. There will be concessions available for purchase and fun for the whole family! 21 Prizes Available. ALL Chincoteague themed. Something for ALL ages! For more details: Visit www.facebook.com/events/541639599669450/. On Tuesday the Ponies will be checked by a vet and can be viewed by the public in the Southern Corral on Assateague. Park in the Woodland Trail Parking Lot, or along the road, to access the Southern Corral. For more details: Visit www.chincoteague.com/pony_swim_guide.html. On Wednesday, the Saltwater Cowboys will swim the ponies from Assateague Island to Chincoteague Island. The Ponies will swim across the Assateague Channel and come ashore on the east side of Chincoteague Island. The specific swim time will be announced at the carnival grounds the week of the swim. After the swim, the ponies rest for about 45 minutes. Then the Saltwater Cowboys will "parade" the ponies down Main Street, to the carnival grounds where the auction will be held Thursday morning. For more details: Visit www.chincoteague.com/pony_swim_guide.html. CCA offers free films outdoors under the stars in Robert Reed Downtown Waterfront Park during the Summer Months. Bring a chair or blanket. Films begin at dusk. Enjoy popcorn and cold drinks at old-fashioned prices! In case of rain, films are shown at the CCA Center for the Arts - 6309 Church Street. Featured film: Whale Rider. For more details: Visit www.chincoteagueca.org/summer-cinema-series.html. The Pony Auction takes place the day after the Pony Swim, beginning at 8 am, at back of Carnival Grounds. For more details: Visit www.chincoteague.com/pony_auction.html. On Friday, the adult ponies will make the return swim to Assateague Island where they will live in the wild for another year. For more details: Visit www.chincoteague.com/pony_swim_guide.html. Music at the Dock is a series of free concerts held at the Robert Reed Downtown Waterfront Park. Bring a blanket or chair, or dock your boat, and enjoy the music. Dancing is allowed! Concerts begin at 7 pm. In concert: Randy Lee Ashcraft and the Saltwater Cowboys. Local favorites Randy Lee Ashcraft and his band (Jimmy Rowbottom, Ken Roughton and Leo Carlins) play their own brand of music often called "Beach Country". Ashcraft has opened for many national acts such as Sawyer Brown, Travis Tritt, and Toby Keith. He has won multiple awards including being the first and only country music artist ever to win the Independent Music World Series. For more details: Visit www.chincoteagueca.org/music-at-the-dock.html. It's time to get crabby! 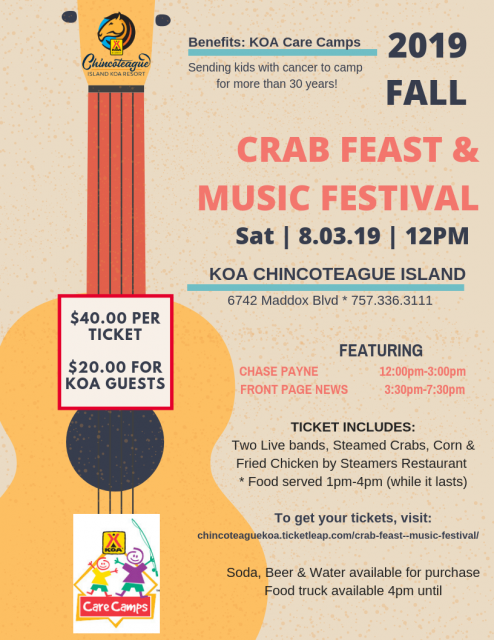 Brush up on your crab picking skills and break out your dancing shoes for our crab feast and music festival. $40 per ticket. $20 for KOA Guests. For more details: Visit koa.com/campgrounds/chincoteague. CCA offers free films outdoors under the stars in Robert Reed Downtown Waterfront Park during the Summer Months. Bring a chair or blanket. Films begin at dusk. Enjoy popcorn and cold drinks at old-fashioned prices! In case of rain, films are shown at the CCA Center for the Arts - 6309 Church Street. Featured film: Wall-E. For more details: Visit www.chincoteagueca.org/summer-cinema-series.html. CCA offers free films outdoors under the stars in Robert Reed Downtown Waterfront Park during the Summer Months. Bring a chair or blanket. Films begin at dusk. Enjoy popcorn and cold drinks at old-fashioned prices! In case of rain, films are shown at the CCA Center for the Arts - 6309 Church Street. Featured film: Being There. For more details: Visit www.chincoteagueca.org/summer-cinema-series.html. Music at the Dock is a series of free concerts held at the Robert Reed Downtown Waterfront Park. Bring a blanket or chair, or dock your boat, and enjoy the music. Dancing is allowed! Concerts begin at 7 pm. In concert: C.A.I.S.O. It wouldn't feel like August on the Island without a visit from Caribbean American International Steel Orchestra, the hottest steel drum band in the Washington DC area. CAISO's music is festive & fun featuring the Steelpan instrument in Calypso, Reggae and Latin Jazz genres. For more details: Visit www.chincoteagueca.org/music-at-the-dock.html. Decoy carving, fine art, jewelry, photography, paintings, and raffles. Some of the finest waterfowl carvings and wildlife art from the area. Meet the carvers and artists. For more details: Call 410-726-4049. Visit www.thechincoteaguecenter.com. 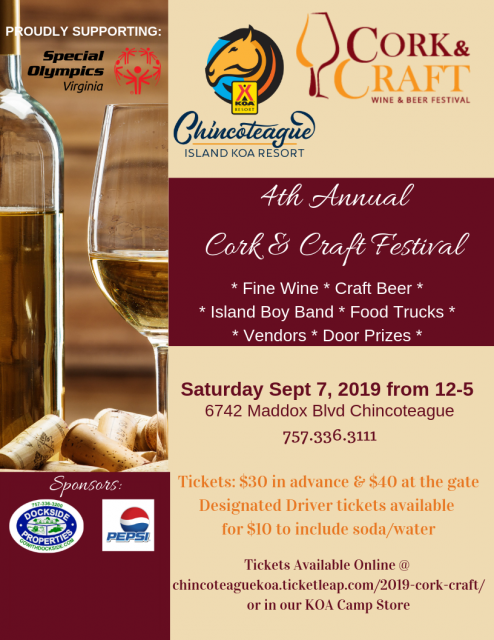 4th Annual Cork & Craft Festival. Fine wine, craft beer, Island Boy band, food trucks, vendors, and door prizes. Tickets $30 in advance and $40 at the gate. For more details: Visit koa.com/campgrounds/chincoteague. Police Department Annual Poker Run for the Kids: Chincoteague Police Dept. For more details: Call 757-336-3155. Chincoteague Cultural Alliance presents Plein Air Art Show and Sale. Each year, the 2nd week of September brings more than 50 fine artists from the Mid-Atlantic and beyond to paint "en plein air" (French for painting outdoors) on Chincoteague and Assateague. On Saturday evening, you can see what they've created at a Show and Sale that is free to the public. Come early; pieces sell quickly! A portion of the artwork sold benefits CCA. For more details: Visit www.chincoteagueca.org/. Entrance fee is waived on this day of observance for National Public Lands Day. For more details: Call 757-336-6122. Visit fws.gov/refuge/chincoteague/. 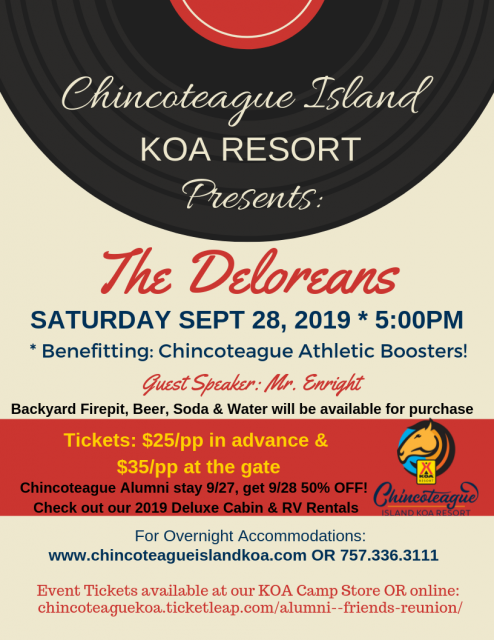 Benefiting Chincoteague Athletic Boosters. Backyard Firepit, Beer, Soda & Water will be available for purchase. Guest Speaker: Mr. Enright. Tickets $25 in advance and $35 at the gate. For more details: Visit koa.com/campgrounds/chincoteague. Chili Chowder Cook-off - Chincoteague Island Carnival Grounds. Free Admission. LIve Music. Arts & Crafts Vendors. Great Food. Raffles. Family Fun. Little Miss Chili Pepper and Mr. Hot Stuff Competition and more. 11 AM - 5 PM. Food service beginning at Noon. Call 757-894-8771 or visit cvfc3.com for more information and event applications. 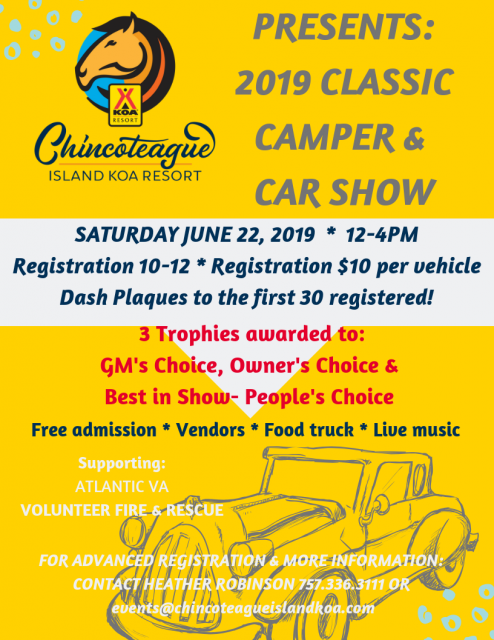 Annual Car Show - Chincoteague Island Carnival Grounds. Registration 10 AM - Noon. Trophies awarded at 3 PM. $10 registration fee benefits new CVFC Fire House. First 50 registrations receive a commemorative dash plaque. Trophies for Best In Show, Fire Company's Choice, Mayor's Choice, and Top 30 People's Choice. For more details: Visit www.facebook.com/ChiliChowderCookoffCarShow/. The Chincoteague Oyster Festival is held to promote the seafood industry and mark the arrival of the oyster season. Come and enjoy oysters-raw, steamed, fritters, and single fried; clam fritters, clam chowder, shrimp cocktail, salad bar, hot dogs, hushpuppies, and Boardwalk fries. Non-alcoholic beverages are included in the ticket price with beer available for purchase. Island Boy, a festival favorite for over 25 years, will provide live entertainment for everyone's listening and dancing enjoyment. Tickets are $45 per person (Children under 5 are FRE)). For more details: Visit www.chincoteagueoysterfestival.com. Fee Free Day - First Sunday of National Wildlife Refuge Week. Entrance to the refuge is free to kick off National Wildlife Refuge Week. For more details: Call 757-336-6122. Email fw5rw_cnwr@fws.gov. Visit www.fws.gov/refuge/chincoteague/. To honor our veterans, entrance to Chincoteague National Wildlife Refuge and other National Public Lands is free. For more details: Call 757-336-6122. Email fw5rw_cnwr@fws.gov. Visit www.fws.gov/refuge/chincoteague/. Fall heralds the return of thousands of waterfowl from their northern breeding grounds to the milder climate of Chincoteague National Wildlife Refuge. Enjoy a variety of overwintering ducks, geese and swans by joining the flocks of visitors who celebrate Thanksgiving Weekend in this special place. Visitors will enjoy extended hours on the Wildlife Loop Trail, open to vehicles from 9am to dusk on November 28 - December 1, 2019. Please drive cautiously, as this trail is also a hiking and biking route. extended access is also available for visitors to drive on the Service Road (admittance from 12pm - 2pm only). For the special drive, visitors must enter the Wildlife Loop Trail and follow the one-way traffic pattern to the road's entrance. This may take 10 or 15 minutes, due to high volume. All vehicles are expected to completely exit the Service Road by 4 PM. For more details: Call 757-336-6122. Email fw5rw_cnwr@fws.gov. Visit www.fws.gov/refuge/chincoteague/. Holly Day Market & Wildlife Art Gallery, 6309 Church Street. Enjoy DECOYS and WILDLIFE ART in the Activities Center. PLUS arts, crafts, jewelry, antiques, holiday decor and more, inside and outside the CCA Community Center for the Arts. 2 Buildings. Over 80 Vendors! AND the final Farmers Market of the Season. For more details: Visit www.chincoteagueca.org/. Held every the 1st Saturday of each Month from 1pm - 2pm. Held at the CCA Community Center for the Arts - 6309 Church St. Young kids please bring an adult. All supplies provided. Taught by CCA artist volunteers. For more details: Visit www.chincoteagueca.org/free-kids-art-class.html. Plan to attend our annual Toy Run. For more details: Call 757-336-3155. Floats, bands, fire companies from all around the Eastern Shore & a special visit from Santa. Join us for New Year's Eve! Held at the Robert Reed Downtown Park. The Pony Island Horseshoe Drop is an end of year celebration that culminates in a promenade of crazy costumes just before the countdown to the stroke of midnight. That's when the lighted horseshoe drops just in time to ring in the New Year! Wear your favorite costume or just be a spectator. For more details: Visit chincoteaguechristmas.com/.